Not that it’s anything new, but U.S. Sen. Jim Inhofe issued a rather dramatic and hyperbolic statement related to a Senate Environment and Public Works Committee hearing this week. This is fairly typical rhetoric for Inhofe, who has based much of his Senate career on denying the reality of climate-change science and supporting the financial interests of the fossil fuel industry. Oil and gas interests have been Inhofe’s largest campaign donors through the years. 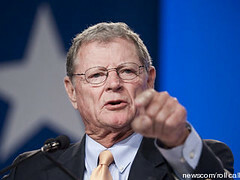 What makes it noteworthy, though, is that Inhofe is claiming that if Republicans gain a majority in the Senate in the upcoming midterm elections, he will once again head the EPW Committee, which could be disastrous to the environment here and, really, throughout the world. Inhofe’s statement argued rules governing emissions from power plants that use coal will result in lost jobs and higher prices, but these are tired and worn claims that simply ignore the impact and cost of pollution.
. . . EPA’s impact may be coal now, but we know it’s going to be natural gas next. Whether it’s hydraulic fracturing or methane emissions, the EPA is intent to carry out what the Sierra Club has named it’s “Beyond Natural Gas” campaign, just as the EPA did with Sierra Club’s “Beyond Coal” campaign. We in the Senate have been charged with stewarding this nation, which includes watching out for those who are most vulnerable. The elderly, the poor – these are the people who are most at risk from losing their homes or their health due to skyrocketing electricity bills, which is exactly what will happen under the EPA’s War on Fossil Fuels. It’s our job to watch out for them, and it just so happens that the entity we need to protect them from is a seemingly unlikely source – it’s President Obama’s Environmental Protection Agency. Note the sanctimonious reference to the “elderly, the poor,” as if Inhofe has ever made their concerns and interests a real focus of his Senate political agenda. In fact, his political career has been rooted in helping the wealthy and privileged in our country at the expense of everyone else. Note, too, the standard GOP bashing of President Barack Obama. This type of political rhetoric and grandstanding doesn’t get more hollow than this. Meanwhile, as Inhofe supposedly frets about the “elderly, the poor” in Washington, his home state of Oklahoma is experiencing a dramatic spike in earthquakes that has been tied to the hydraulic fracturing or fracking drilling process. For many parts of Oklahoma, daily earthquakes are just routine now. Oklahoma had the second highest number of earthquakes in the contiguous U.S. in 2013. Does anyone here think Inhofe will push for stronger regulations in the oil and gas drilling process to stop the earthquake surge here? Pundits predict Inhofe will easily win reelection this November, and that’s not good for Oklahoma or the planet. If he does become chair of the EPW Committee, it will be even worse.